I was the lucky recipient of two jars of Love this week.. What are jars of Love, you ask.. I'll tell you. jars of Love are goodies that friends or family make with Love, and pass on to others. These jars can be any fruit or vegetable canned, or any baked goods. 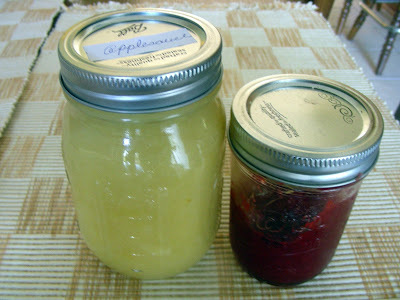 The jar on the left is chunky applesauce, made from the apples in my friend Anne's tree.the applesauce is awaiting fluffy pancakes with cinnamon. The jar on the right is Door County Cherry Jam made by my friend, Carolyn and her sister, Janet.. For those you not from the Midwest, Door County is in Northern Wisconsin. Many people migrate to Northern Wisconsin each summer to get the wonderful cherries, but now a local Chicago land grocery store sells frozen containers full of the ruby delights. As you can see we have already opened the cherry jam, enjoying it on our morning whole wheat English muffin with peanut butter. To the people, like me that don't do canning, fresh made canned goods are wonderful. I take that back, before my husband's heart surgery, we made Lime pickles. The recipe was from my 80yr old aunt, who had always made them, and they were like a family treasure. It was a two day process but well worth the work. Unfortunately, those pickled had a very high sodium content, so we don't make them any more. Maybe that's why when someone gives us a jar of Love, we appreciate the gift so much. I'll continue to bake the cookies, muffins, cupcakes, brownies etc., and give some of those gifts of love away, but somehow the jars of Love hold a special place in my heart. So for those of you who do the canning of the fruits and vegetables, keep doing what you're doing, because when you give a jar away, it becomes a jar of Love to the recipient. What wonderful little jars of love! That means they must love you to have given them to you! I love cherry jelly, next year I want to get a bunch and try and make some myself! i love these jars of love... it's a lovely gesture. Gina- thank you for the comments. blackbookkitchendiaries- thank you for the comments. what a lovely thought and expression- Jars of love! What a wonderful post. I give gifts of love in the form of loaves of bread and pans of brownies, but my best friend sends me "jars of love" and they also hold a very special place in my heart. Her homemade jams are some of my most favorite gifts. Thank you for sharing, and thank you for your kindness! Monet- You are welcome and I continue to hold you and your family in my thoughts and prayers. Hi Becky! I just love this! It is a wonderful post, just full of the goodness. These are the real reasons we cook and bake. As it is the sharing that keeps us going! And how much fun to purchase frozen Door County Cherries! I remember my first 10 lb. bucket! We drove it home all the way from door county! =Chow and Chatter-I look forward to reading your posts. Megan-I have purchased those frozen 10 lb buckets of cherries, too, driving all the way back to Chicago. It's nice to be able to but them local now. Thank you for your comments. Susi-You are welcome. Thank you for the comments. -bunkycooks My husband shouldn't have the high sodium canned goods like pickles. He can eat the jam, jellies, fruit, etc. I know from reading your posts that you have done a lot of canning, a labor of love.